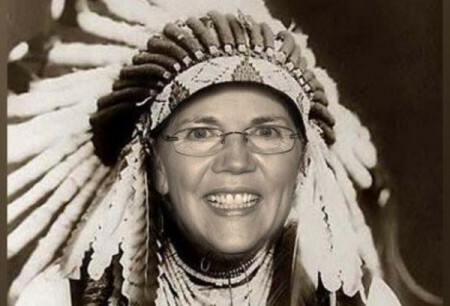 We thought surely that Sen. Elizabeth Warren had reached rock bottom when she took a very public DNA test to “prove” that she was about as much an American Indian as literally anyone else in the country, but we were sorely mistaken. This week, confronted with a Texas State Bar registration card that was filled out in her own handwriting in 1986, Warren realized (belatedly) that the only thing left to do was apologize. So this has been her grand apology tour for falsely claiming to be a Native American for, oh, long about thirty years. Making things worse, Warren sheepishly noted that there may be other documents out there where she fraudulently called herself an Indian. That’s not a “distinction,” Liz. You’re literally not a Native American. You’re a white chick engaged in what the left loves to call cultural appropriation. But it’s really worse than that, because this isn’t like showing up in dreadlocks to a party or releasing a tasteless rap video. You are pretty much the Indian equivalent of Rachel Dolezal, the white woman who wants the world to believe that she’s really a black woman inside. Asked if the public could expect more documents to emerge where Warren claimed to be a Native, she essentially said that it was all but certain. We’re guessing this “stories/tribal citizenship” thing is something her public relation specialists have told her to emphasize, but it’s pretty weak sauce. This really isn’t about how many Indians this woman has offended or how much/little this whole thing has helped her career. It’s about the judgement of a woman who thinks she should be the next president of the United States. If you didn’t think to question your surroundings, your white family, or your own face in the mirror at any point growing up – if you never said to yourself, gee, I don’t think I’m a Cherokee Princess after all – then you don’t have any business calling the shots in the White House.